In my last blog post I talked about how to engage two muscle groups that are responsible for stabilising the lower back, pelvis and torso. The Transverse Abdominals (TA) and Multifidi can be tricky muscles to tune into as their engagement creates a more subtle sensation of stabilisation compared to the muscle burn we might be used to feeling in say a bicep curl or a squat! Nevertheless these stabilising muscles play a very important role in maintaining good hip and lower back alignment and creating a seamless fluid transition between movements making us more efficient and less prone to injury in daily activities and sport. These muscles are also particularly useful to look at when it comes to rehabilitation after a period of lower back pain. Start by lying on your back with your knees bent, feet on the floor hipwidth apart and parallel in constructive rest pose. Bring your fingertips to the skin just to the inside of your frontal hip points. To engage the deep lower abdominal muscles, imagine you’re trying to narrow the hip-points and at the same time zipper the skin of the lower belly in and up towards the naval. The skin under your fingertips should tighten and draw down slightly as the lower back stays in a neutral position. You will feel your breathe move more into your chest as the belly remains still. Breathing naturally and maintaining the awareness of the lower belly bracing on your next inhale extend opposite arm to leg out along the floor. As you exhale return to the starting position, arms by your sides, knees bent. Then inhale to switch sides. Continue to go side to side with the breath for about 1 minute. As you do this movement avoid letting the hips rock or the lower back overarch or flatten. The arms and legs are moving but the torso, lower back and pelvis remain still throughout. To make this movement more challenging, you can explore hovering the heel away from the floor. For toe taps start by lying on your back, bringing your knees up over your hips, shins parallel to the floor and the feet flexed, as if you were sitting in a chair. Avoid allowing your lower back to hyper-arch away from the floor but also do not flatten your lower back down – try to find a neutral curve in your lower back. At the same time, bring your hands to the skin to the inside of your hip points. Feel for narrowing the frontal hip points and drawing the lower belly in and up. Both these actions will ensure that the transverse abdominals and the multifidi are switching on. Inhale, and as you exhale lower your right foot towards the floor, tapping the toes whilst keeping the knee bent and minimising any movment in the lower back or hips. On an inhale return to the starting position. Continue going side-to-side for about 1 minute. If this proves difficult to control and your lower back is starting to over-arch or your abdominals start to bulge out, explore not lowering the legs as far, maybe hovering the foot a few inches from the floor as you lower. Alternatively if this becomes easy and you want more challenge try straightening out the leg that you lower, floating the leg 1-2 inches off the floor, all the while keeping your lower back, hips and torso still and steady. Start in an all-fours position. Knees hip-width apart and hands under your shoulders with the fingers spread and knuckles rooting into the mat. Gently draw the shoulder blades down the back away from your ears. Feel for bringing your spine into a neutral position (use a mirror if needed) with its natural, neutral curves intact. Become aware of a long line of energy from the crown of your head out to your tailbone. To engage the the lower abdominal muscles imagine you are narrowing your waist as if to tie up a belt a couple of extra notches, and at the same time zipper the lower belly from the pubic bone up to the naval. Maintain this abdominal bracing as you continue to breathe steadily in and out through your nose. Keeping your lower back long in neutral (don’t allow it to overarch), on an inhale slide your right leg back behind you. Lift the leg only as far as you can whilst maintaining length in your lower back and keeping your hips square to the floor. For more challenge you can reach the opposite arm forwards, spinning the palm to face inwards (like you’re going to shake someone’s hand) keeping the shoulders away from the ears. Hold for 5 breaths. As you next exhale lower the right leg (and arm if lifted) back to the starting position. Inhale to switch sides. You can also vary this work by moving more fluidly with the breath, going side-to-side for about 1 minute. First of all what is core stabilisation? In yoga, the term ‘core’ is used to broadly describe all of the musculature that supports and stabilises the lumbar spine, sacrum and pelvis. Stabilising muscles do not change length during movement; rather they stabilise and support the trunk during movement, which can be particularly helpful for students in the rehabilitation and prevention of lower back pain. 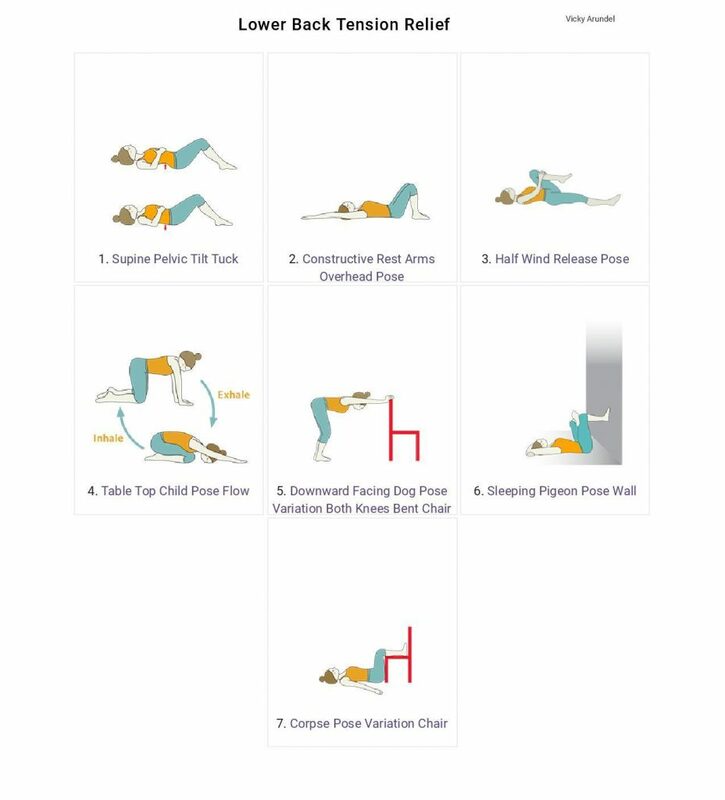 Studies have shown that core stabilisation exercises which train and strengthen the deep abdominal muscle called the Transverse Abdominals (TA) and the deep spinal stabilisers called the Multifidi can be effective in helping to reduce pain and the risk of re-injury. One study, in particular, showed that people who’d been trained to strengthen their spinal stabilisers had only 30% recurrence of lower back pain after one year, versus a control group who were not given any spinal strengthening exercises and suffered an 84% recurrence rate. in slight back-bending or extension movements, particularly performed against gravity, such as Bird-Dog pose. It’s important to understand that the co-contraction of TA at the front of the trunk and the Multifidi at the back of the trunk will serve to maintain a neutral curve in the lower back and pelvis. Hence core stablisation techniques which work both the TA and Multifidi are all exercises in which the trunk is kept still and in neutral whilst the arms and legs move to provide challenge. How do I engage the Transverse Abdominals and Multifidi? To get a sense of how to engage these muscles start by lying on your back in Constructive Rest Pose. Have your knees bent, feet on the floor about hipwidth apart and parallel. You should notice that your lower back is in its neutral curve and we want this to remain the case throughout the whole exercise. Bring your fingertips to the skin just to the inside of your frontal hip points. In a relaxed state the skin beneath your fingers should feel relaxed and soft. Breathe in allowing the belly to relax. As you breathe out imagine narrowing the hip points towards one another as if you were tightening a drawstring, and at the same time, zipper the lower belly in and up as if you were doing up a tight pair of trousers. The muscle beneath your fingertips should feel like it firms. The belly will also flatten slightly, as if you are sucking the contents of your abdomen up and back towards your spine. However do not flatten your lower back or tilt your hips back during this contraction as this will stop the multifidi from serving their proper function, which is to maintain the neutral curve of the lumbar spine. Breathe in to release the contraction, as you breathe out repeat. This is a subtle engagement working at about 10-20% of your maximum effort. Repeat for 5-10 breaths. Continue with the above exercise but this time, as you breathe out imagine the muscles of the lower back contracting slightly upwards the naval at the same time as the TA engages drawing the naval in and back towards the spine. It’s as if the front and back of your body were coming closer together or co-contracting to meet in the middle of your body each time you exhale. Again, the engagement is subtle and the pelvis or lower back should not move. Repeat for 5-10 breaths. With this idea in mind, in my next blog post we’ll explore some of my favourite exercises for teaching core stabilisation to my clients that train to stabilise the core and lower back whilst mimicing real life movements. Stay tuned! Credits to Tummee for their awesome images!